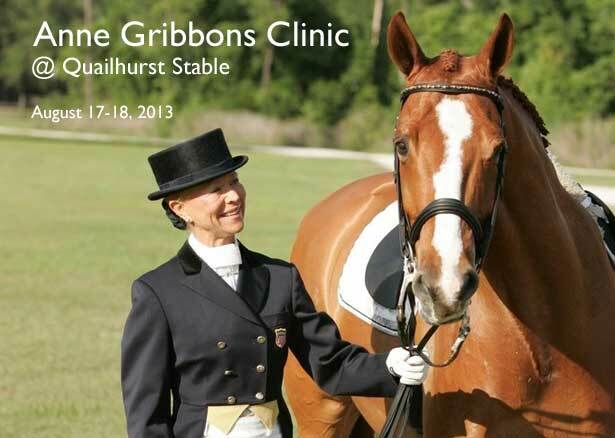 We are looking forward to having you come to the Anne Gribbons** clinic next weekend August 17-18th. We have an eclectic group of horses and riders and should provide something for all levels of our discipline. Included in our day will be horses from the age of 3-16 years old including some that have never been ridden before. There is a chance that just may happen during our weekend to provide auditors with an opportunity to see how we start our youngsters under saddle. Paid Auditors will be provided with all day snacks and lunch in our garden tent between the hours of 12:00-1:00 daily. In addition Quailhurst wine will be available for purchase by the glass. Seating is provided and our plan is to be in the outdoor arena weather permitting. If you wish to audit we appreciate you letting us know so we can be sure to have your lunch ready for you! 12:45-1:30 Josh Shambaugh and Deborah working Quailhurst 3-4 yr old horses. ** In her long career in International level dressage, Anne has ridden in numerous North American and World Championships. She has most recently served as U.S. Dressage Team Coach (2010-2012) and is a Federation Equestre International “O” judge. Her knowledge of training horses to the highest level and understanding of the playing field of International dressage is unparalleled. Deborah and her two mares, Alexiss and Verona, have recently returned from a four month Winter training session with Anne in Florida; the entries from her training journal can be found here.